Cosmic Sister has awarded 15 grants to support educational presentations by female environmentalists, humanitarians, scientists, artists, and mind-body-spirit wellness experts at upcoming events focusing on psychedelics, entheogens, and cannabis. Last year Cosmic Sister sponsored actress and cultural activist Kateri Walker at the Spirit Plant Medicine conference in Vancouver, BC, and she received a passionate standing ovation. “I took a big breath. I opened my heart with Love, I asked Grandma Aya to embrace me, and I spoke. I spoke my truth. I spoke my love. And then I faced my fear. A life of fear that denied me my voice,” Kateri said. Landscape architect Susan Sheldon, who spoke at the Cannabis & Hemp Conference in Vancouver, BC, last year, was the only plantswoman in a line-up of male growers. “The Cosmic Sister grant gave me an opportunity to speak with a feminine voice for cannabis and to the relationship we, as growers and consumers, have with the plant medicine,” Sheldon said. Helene also promotes safety (especially for women) and responsibility. “Stay legal, even when you feel the laws are antiquated—which they are,” she said. Cosmic Sister awarded three WPR grants to support presentations at Sleeping Octopus Assembly on Psychedelics (SOAP) in Pittsburgh July 13 – 15: indigenous peyote sustainability researcher Dawn D. Davis, PhD. (cand. ); Vilmarie Fraguada Narloch, PsyD., an expert on harm reduction in clinical practice; and Monnica Williams, PhD., ABPP, who specializes in cognitive-behavioral therapies with a focus on racial PTSD. Cosmic Sister awarded two CSC grants to support presentations by cannabis geneticist and entrepreneur Eleanor Kuntz, Ph.D., and integrative medical doctor Selma C. Holden, MD, who will lead cannabis-enhanced yoga at Healing Power of Cannabis (HPC) conference in Montpelier, Vermont, on September 15. For this year’s Spirit Plant Medicine (SPM) in Vancouver, BC, November 2 – 4, Cosmic Sister awarded four WPR grants in support of presentations by sociologist, yoga teacher, and former Olympic athlete Samantha Retrosi; counselor and psilocybin political campaigner Sheri Bessi Eckert; author and entheogenic medicine integration coach Elisabeth Bast; and ethnobotanist and interdisciplinary scholar Claudia J. Ford, PhD, and one CSC grant for cannabis entrepreneur and educator Selena Wong. Writer and human rights activist Ifetayo Harvey received a WPR grant to present the keynote speech in New York City at the launch of the People of Color Psychedelic Coalition (working title), a new group she founded for people of color to change the discourse around psychedelics, plant medicine, and harm reduction in New York City this September. 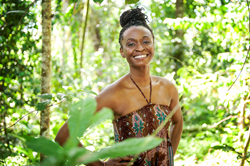 Cannabis entrepreneur, yoga instructor, and massage therapist Chioma Nwosu was awarded a CSC grant in support of her new cannabis yoga series, Elevated CannaFlow, in Los Angeles.